Apple CEO Tim Cook criticized the way U.S. President Donald Trump has handled trade with China in a meeting in April, it has been revealed, with Cook advising to focus on cooperation between the two countries instead of participating in a trade war. 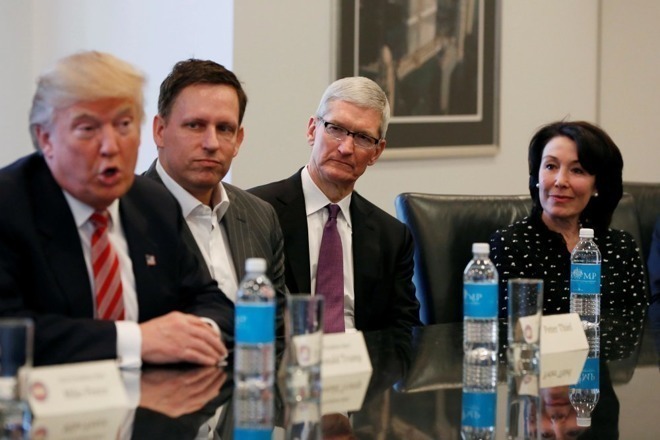 In the White House meeting held last month, Cook told Trump his trade policies with China had issues, the Apple CEO advised to Bloomberg. While acknowledging trade policies made by earlier administrations had their flaws, Cook insisted Trump's actions against China were also a problem. Around the time of the Oval Office meeting, the Trump Administration added a 25-percent tariff on at least $50 billion worth of produce supplied from China. In retaliation, China announced it would institute 128 tariffs on U.S. goods. "I felt that tariffs were not the right approach there," tells Cook, continuing "and I showed him some more analytical kinds of things to demonstrate why." Cook also encouraged Trump to consider cooperation with China, reasoning that two companies working together can boost their economies more than a single nation working on its own. Apple has an interest in keeping the trade relationship between the U.S. and China healthy, with the countries representing two of the three largest markets for the company. In the latest quarterly results, Apple earned $13 billion in revenue from Greater China alone, while the Americas provided $24.8 billion. Apple's production partners for iPhone, iPad, and other hardware also reside in China, and while there are no major trade issues affecting Apple's manufacturing partners yet, it is possible the current U.S. attitude to trade with China could create problems at a later time. Cook also used the meeting to appeal for a resolution to the Deferred Action for Childhood Arrivals (DACA) program issue, which effectively ended protections for immigrants brought into America as children from being deported. Despite campaigns from tech leaders, including Cook, for lawmakers to put protection in place for the so-called Dreamers, a solution has not yet been implemented. "We're only one ruling away from a catastrophic case there," Cook warns. Earlier comments about the meeting from White House Director of the National Economic Council Larry Kudlow praised Cook's experience in relation to China, calling the Apple CEO "most helpful" during the meeting. Cook is also said to "love the tax cut and tax reform," according to Kudlow, calling it "great for business" and helpful for "building plants, campuses, adding jobs," and other investments in the U.S.